Featuring cutting edge technology, the Kyocera KM-2035 printer is ideal for office or family usage. Undoubtedly your Kyocera KM-2035 will polish off its printer toner, and when that does happen you'll learn that ordering Kyocera KM-2035 toner can be an expensive affair. Thankfully, however, you don't have to panic about paying the high costs you'll uncover on the main street because here at Cartridge Save you can purchase all the Kyocera KM 2035 cartridges you will ever need at really low prices. Save a lot of cash by buying online with Cartridge Save! Don't pay high prices for a KM-2035 original cartridge or KM-2035 compatible toner in the high street when it is easy to save a bundle of cash shopping online with Cartridge Save. Have one hundred per cent confidence when purchasing KM2035 toner cartridges from us because they are all underwritten by a no quibbles money back guarantee. Don't forget that each order has free delivery, mostly delivered on the following working day! Users in need of a desktop digital printer can get the Kyocera KM-2035 printer. This mid-entry level unit can deliver a maximum resolution of 600 x 600 dpi and copy as many as 30,000 pages per month. It comes with 32 MB standard memory, which can be upgraded to 160 MB. The Kyocera KM-2035 desktop digital copier offers duplexing, stacking, and reverse automatic document feeding but only as options. The Kyocera KM-2035 mono laser printer weighs 86 lbs. and measures 22.6 x 21.8 x 19.8 inches. It can handle 350 sheets at a time, but the integration of optional trays can bring the total paper handling capacity to 1,250 sheets. Copy speed can go as fast as 20 cpm for letter sized media with the first copy coming out in 5.9 seconds. The Kyocera KM2035 black toner cartridge has an estimated capacity of 15,000 pages. 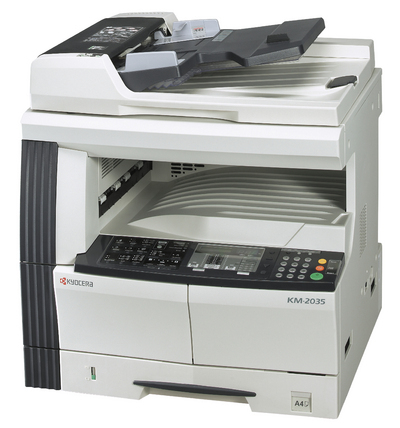 Users will have no trouble operating the uncomplicated Kyocera KM-2035 copier. This copier also requires little maintenance and uses high-yield consumables. It has high paper handling capacity and monthly duty cycle and the black and white Kyocera KM2035 photocopier delivers good quality output. Some of its additional features include electronic sort, paper select, auto magnification, and sheet and border erase. The automatic document feeder and automatic duplexer are not standard to the unit. The Kyocera KM 2035 laser printer also offers PC printing as an option. Performance speed can use a boost to be able to keep up with competitors.